Count on Quality Service for Everything From Minor Leaks to Complete Kitchen Upgrades! Whether you are dealing with minor plumbing troubles or major problems like that wet stain spreading across your ceiling, we can have it fixed fast. Matlock Plumbing in Columbus, IN offers professional residential and commercial services for slow drainage, leaky faucets, broken pipes, and more at rates that won’t break the bank! We offer exceptional services to keep your plumbing systems working at their best. You can also call us for quality installation for your new construction or remodeling project. Boost the aesthetic and market value of your home with a custom kitchen or bathroom upgrade today! Get Service for Everything, From Water Pipes to The Kitchen Sink! Leave the tedious job to plumbing experts who can handle every job you need them for. At Matlock Plumbing, you can expect cutting-edge technology and a wide range of expertise. Your faucet is an integral component of your plumbing. Should you need faucet installation, repair, or replacement, you can depend on us to provide the right services. We have been providing plumbing services in Seymour and Columbus, IN for many years. Our job is to make sure that your faucets are in tip-top condition. We repair faucets of all makes and models. Our experienced plumbers ensure that each faucet is completely repaired and working at its best. If your faucet is beyond repair, we can provide you with a replacement. We offer accurate faucet installation for a smooth flow of water in your kitchen, bathroom, or laundry room. We will get to the root of your faucet repair issue and fix it quickly and efficiently. Whether your faucet has faulty or corroded parts, Matlock Plumbing can get it working again. We feature top-quality brands in our inventory, and we offer accurate faucet installation services from highly trained plumbers. Rest assured we will perform faucet services according to the highest industry standards. Your sinks undergo everyday use, and over time, they may need repair or replacement. When your sink isn’t operating well, Matlock Plumbing will provide the solutions you need. As one of the leading plumbing companies in Seymour and Columbus, IN, you can depend on us to complete your plumbing project using our skills and expertise. Our experienced plumbers are equipped to service virtually all types of sinks in need of repair. From clearing clogged drains to replacing corroded or missing parts and repairing water spigots, you can trust us to fully repair your sink. A new construction or remodel calls for experienced sink installation services. Matlock Plumbing provides the sink installation services you need to have a beautifully finished bathroom. We install state-of-the-art sinks manufactured by trusted industry brands. 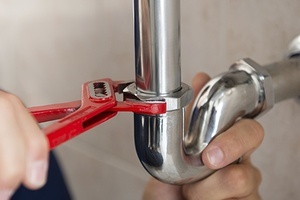 From complete sink replacement to water valve repair, our insured and licensed plumbers have the technical know-how to provide the best services. We have a comprehensive understanding of sink repair services, and we will ensure your sink is operating at its best.